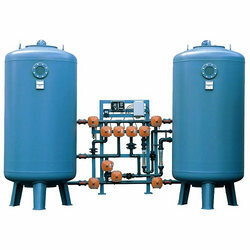 We are leading manufacturer of Water Softener and our product is made up of good quality. Softener plants come with different lining support like of rubber, FRP and others with top mounting valve support for easy control of operations. Some of its features include available in the compactly designed finish, support elimination of dissolved ions like calcium magnesium from water, available as up flow down flow types. 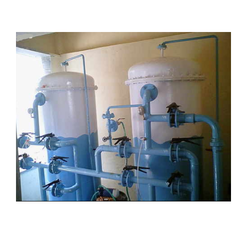 We are engaged in the manufacturing and supplying of Water Softening Plant. The vessel provided with frontal piping has top mounting and valves to control the operation of the unit. The softeners used are based on ion exchange process. These compact, self-contained systems comprise one mild steel/FRP pressure vessel, frontal piping with strong acid cation exchange resins in sodium form. The resins help eliminate the dissolved ions like calcium & magnesium from water producing high-quality soft water. A vessel that is filled with a bed of softening media supported on a bed of caution resin. Scale removal for pipelines, water heater, chiller and A/C Plant. General purpose for the resident ion. Looking for Ion Exchange Plants ?